When you stay at Casa Margarita Hotel in Rincon de Guayabitos, you'll be near the beach and 13 minutes by foot from Tianguis Market. 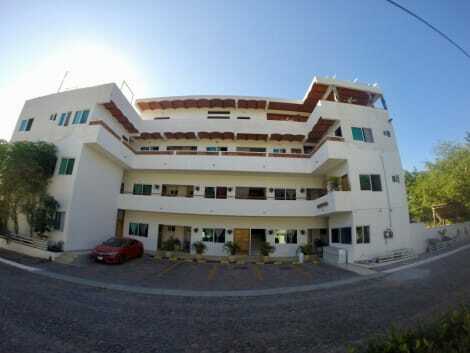 This hotel is 8.4 mi (13.5 km) from Lo de Marcos Beach and 28.1 mi (45.1 km) from Playa Bucerias. Make yourself at home in one of the 18 air-conditioned rooms featuring flat-screen televisions. Complimentary wireless Internet access keeps you connected, and satellite programming is available for your entertainment. Bathrooms with showers are provided. Conveniences include ceiling fans, and housekeeping is provided on a limited basis. A stay at Las Cabanas Del Capitan places you in the heart of Rincon de Guayabitos, a 2-minute drive from Tianguis Market and 7 minutes from Isla del Coral. This beach lodge is 8.6 mi (13.8 km) from Lo de Marcos Beach and 28.3 mi (45.5 km) from Playa Bucerias. With a stay at Villa Corona del Mar in Rincon de Guayabitos, you'll be by the sea, just a 2-minute walk from Isla del Coral and 10 minutes by foot from Fisherman's Memorial. This hotel is 9.5 mi (15.3 km) from Lo de Marcos Beach and 29.2 mi (46.9 km) from Playa Bucerias. You can enjoy a meal at Flamingos serving the guests of Costa Alegre Hotel & Suites, or stop in at the snack bar/deli. Wrap up your day with a drink at the poolside bar. Relax at the full-service spa, where you can enjoy massages, body treatments, and facials. Additional features at this property include complimentary wireless Internet access, gift shops/newsstands, and tour/ticket assistance. lastminute.com has a fantastic range of hotels in Rincon De Guayabitos, with everything from cheap hotels to luxurious five star accommodation available. We like to live up to our last minute name so remember you can book any one of our excellent Rincon De Guayabitos hotels up until midnight and stay the same night.